One thing I love about living in L.A. is not being bundled up in a coat for practically half a year. One thing I don’t love about living in L.A. is rarely being able to wear a coat at all. But I choose to look on the bright, always-sunny side (I hardly have a choice) and revel in the the jackets and maybe two layers we don in the dead of winter. This works out well for me, especially when I score a jacket like the one above. After all, who’d wanna cover that darling little thing up? 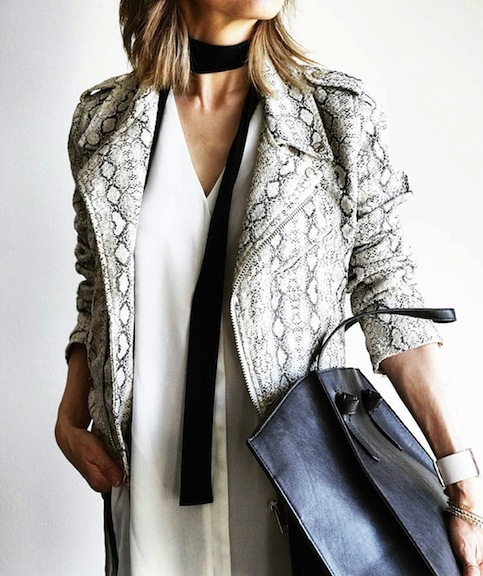 The black and white snakeskin print of the Faux London moto style jacket (now on sale) is the perfect minimalist foil for when I want to keep it simple without being plain or monochromatic. I paired it with a long origami-style tunic from ASOS (also on sale), as well as my winter must-have, the long skinny scarf. To keep it work-friendly, just add a minimalist tote from Zara. I seem to be a bit obsessed with snakeskin this winter, this time a cream and grey-ish heel with lace-up straps. I wore a lot of lace-ups over the summer, so I thought I’d be sort of over lace-ups by now, but nope. I really like the way they look on me. They sort of give me that interesting detail at the ankle that I like about ankle boots, without shortening my legs the way ankle boots tend to do, especially when I’m wearing a cropped pant or a skirt. 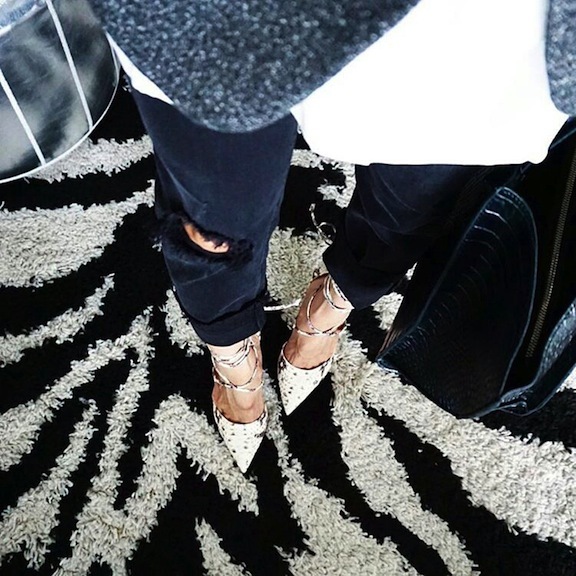 These Steve Madden “Raela” heels pretty much go with everything, and again, the snakeskin adds interest to an otherwise black and white outfit. It’s not just snakeskin I’m into this winter! I still like me some leopard, in moderate doses of course, and this cross body clutch offers just a bit of glam to one of my favorite buys this winter — a classic black blazer with strategically placed cut-outs at the shoulder. This is one of the many reasons why I love living in L.A. — I would never want to cover this up little steal from H&M with an oversized coat. It gives an otherwise typical jeans-and-blazer look just enough edge and interest, and I’ve worn this for work, out on date night, pretty much everywhere. Now this is the bottom half of the cut-out jacket outfit. I actually hadn’t worn jeans since the early aughts, but I’ve rediscovered them this winter. I’ve always hated buying jeans because, like many, I had a hard time finding a pair that accommodated all my quirks. My cousin recommended DL1961 jeans, raving about how they “moved with you,” but at $178 a pop, I was going to have to actually make a trip out to my local Nordstrom to try them on in person. I’m still planning on doing that — white jeans, my next denim buy, is a whole other animal — but I was thrilled when I found that Zara’s jeans actually had a lot of stretch and yet still hugged me in all the right places (read: my wide hips and my too-skinny calves and ankles). I absolutely am obsessed with the fringe detailing on the bottom — I can fold them up for a cropped look, or leave them down and they hit perfectly at the ankle rather than puddling (a rarity for me). Even better? I got them on sale for $30. This is just an easy look — in fact, I wore it to Thanksgiving. One, it is forgiving. The torn jeans are boyfriend jeans from Zara and they are super comfortable, but because they’ve got some stretch, they don’t look unnecessarily baggy and sloppy. 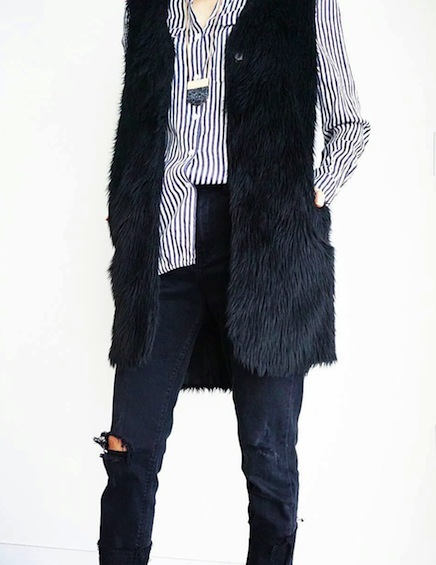 When paired with a crisp striped button-down, half-untucked, and a long sleeveless fur jacket, I look presentable without giving away the fact that I can chow down and still have room to breathe. Because while I know fashion is often pain, when I can eat and look good — that’s the ultimate in style.